Retail sales reverse two-month slide. Retail sales rose 0.8% in October, reversing a two-month slide from weather-related weakness and beating consensus estimates for a 0.5% increase. Retail control-group sales, which are used to calculate gross domestic product, climbed 0.3%, below consensus estimates of a 0.4% gain, showing that core retail spending was slightly weaker than expected. We still believe that the U.S. consumer is the healthiest in years, aided by fiscal stimulus and modestly accelerating wages, and strong consumer demand will drive output going forward. Brexit deal fallout. Tensions are heating up over U.K. Prime Minister Theresa May’s proposed plan for the country’s exit from the European Union (“Brexit“). U.K. politicians are in the middle of an emergency meeting to discuss the agreement, and multiple Brexiteer ministers have stepped down since the plan was unveiled, including Brexit Secretary Raab, hinting it could be tough to gain enough support for the deal to make it through Parliament. European stocks have dropped nearly 1% over the past two days, and global equities could endure volatility amid Brexit-related headlines. Trade and auto disruptions weighed on the German economy. The German economy contracted and missed expectations during Q3 as gross domestic product (GDP) shrunk by 0.2% vs. Q2 (-0.7% annualized). Weak auto sales were largely to blame as new emissions tests disrupted auto manufacturing, but falling exports clearly suggested a drag from trade tensions. German auto production fell by double digits in September. More broadly and more recently, vehicle sales in Europe fell 7% in October from the year-ago period. Weather disrupts Japanese economy. Japan’s economy was dragged down by temporary factors, as GDP slipped 1.2% on an annualized basis during Q3 (Bloomberg consensus was -1.0%). Weather disruptions were mostly to blame, including an earthquake, typhoons, and torrential rain, suggesting a potential rebound in Q4. 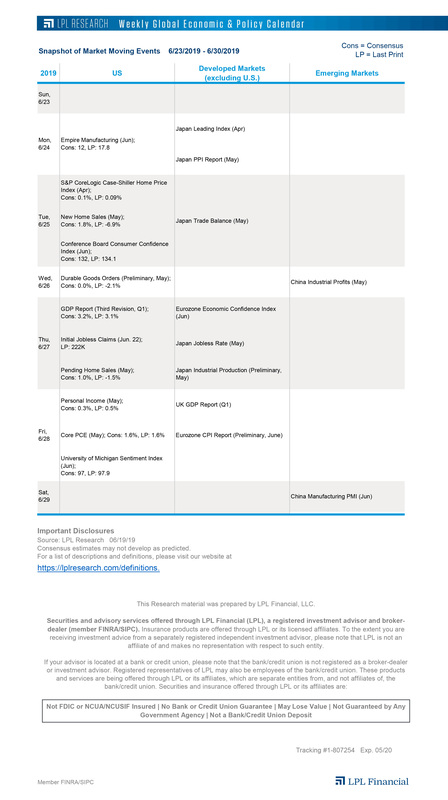 Trade and an upcoming sales tax hike risk derailing that rebound, though it appears the Trump administration will hold off on tariffs on Japanese autos while the two countries negotiate; structural reforms and monetary policy remain supportive. We continue to see China as the primary target for trade talks and expect Japan (and Europe) to remain mostly ring fenced. China high-level talks are happening. It’s just one headline, but in a rare piece of positive news on the China trade front, Bloomberg reported overnight that Chinese officials have outlined a series of potential concessions to the U.S. Though the offer reportedly fell short of the major reforms that the Trump administration has been demanding, it’s positive that substantive talks are happening. China’s economy is clearly slowing, putting increased pressure on the country to more actively pursue a path to a deal up to and during the Trump-Xi meeting at the G20 on November 30 and December 1. Later today on the LPL Research blog, we’ll look at some of the cracks starting to show in the global economy as producers brace for possible unintended consequences of the trade dispute.